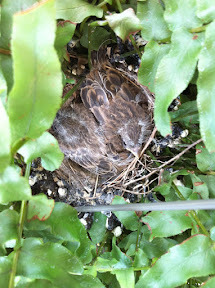 Photo by Marilyn- Sparta, NJ: House Sparrow Nest?? These chicks hatched from very small light blue eggs with brown speckles about 10 days ago. My 8 year old son discovered the nest in a hanging fern on our porch as he took it down to water it... What a surprise! Wonder when they will start to fledge?